Today's readings tell us that God makes things new in Christ (2 Corinthians 5:17). We must follow Christ in order to be part of this renewal. This following of Christ will not be easy. We must suffer greatly (Matthew 10:18). In the first reading, we are told that God is going to start a new covenant with the house of Israel and the house of Judah. This covenant will be different from the one the Israelites were used too. Before, God showed Himself to them and brought them out of slavery. He would work His wonders before them and others, showing that He is God (Psalm 95:9). Now things will be different. He is going to place His law in their hearts (Psalm 37:31). Here we see how God is preparing humanity for Jesus. He is setting a place in man's heart for Himself (Ephesians 3:17). This new covenant will include not only Israel and Judah, but the rest of the world (Jeremiah 31:1,3-4,7-8, John 11:52). The old covenant was a preparation for the new. This is why Jesus did not come to abolish the old, but to fulfill it (Matthew 5:17). The old is part of the new. It is a religious and spiritual metamorphosis. However, in order to be part of this new covenant, we must be pure of heart, mind and soul. This brings in the Psalm for today. In the responsorial Psalm, we recite, "Create a clean heart in me, O God." We ask God for mercy and ask that He in His generosity and goodness restore His image in us by wiping clean all that exists in us that keeps us from this image (Isaiah 1:18). Only God can do this (Psalm 51:7). God is the only one who knows us inside and out (Psalm 139:2). He can perceive our introspection and know our temperament. We were created by Him, we come from Him (Genesis 1:27). His breath and word are what keeps us in existence (Genesis 2:7, Psalm 39:5, Matthew 4:4). This washing of the soul brings back joy in us. God reestablishes His friendship with us. In response, we must call others who are in sin and bring them to this spiritual laundry mat that is God's grace, so to speak (Colossians 3:16, Romans 15:14, James 5:20). This cleaning is done with the blood of the lamb who was slain (Revelation 12:11). His suffering redeems us and restores us as we read in the second reading. The second reading reminds us that Jesus prayed and offered Himself for all of us. Today's second reading is sometimes used by Jehovah's witnesses and Muslims to claim that Jesus was not god. To them, he was either a demi-god or a prophet. The words, "he learned obedience" and "was made perfect" seem to indicate this. However, we must understand that Jesus was both God and man (John 1:1, 14). He had two natures and one personhood. This is called the Hypostatic union. The fact that He was God did not make His humanity any different. He experienced everything human beings experience except sin (Hebrews 4:15). Christ ate, drank, cried, experienced different emotions, thought, learned etc. He was not some magical deity walking the Earth like Hercules fighting Titans and what not. For all intent and purpose, Christ lived like an "average joe." So because of this, He learned obedience and was made perfect in the sense that His humanity was authentically human. Since He did not succumb to any temptation and followed through with the will of His Father, Christ became the source of our salvation. He is the new Adam (1 Corinthians 15:45). Finally in the Gospel we read of Jesus' agony. Jesus announces the hour has come for the Son of Man to be glorified. This hour is the new beginning. The beginning of the new covenant signed, sealed and delivered by the suffer death of Christ. Jesus says, "unless a grain of wheat falls to the ground and dies, it remains just a grain of wheat, but if it dies, it produces much fruit." Here He is referring to Himself. His death on the Cross had to occur. Jesus had to suffer in order to redeem us. Humanity got into trouble via sin and death, so Christ would use the image of sin (humanity) and death to save the world (Romans 5:12-18). If we are to call ourselves Christians, then we too must suffer (Matthew 16:24). Jesus reminds us, "whoever loves his life loses it, and whoever hates his life in this world will preserve it for eternal life." This means that we must be open to suffering and even martyrdom if it comes to that (Matthew 24:9). This life that we live today is not what we were meant for. Humanity was meant for so much more. Today we are learning of the many Christians being killed. These are the martyrs of today who follow Christ to the cross. Their reward will be in heaven. Instead of focusing on the rewards of this life that wither like a crown of leaves, they focus on the crown in heaven that never withers (1 Corinthians 9:25). These Christians unite themselves to the suffering Christ. We too are united when we suffer for the faith (1 Peter 2:21, 2 Timothy 2:12, Romans 8:17). The agony of Christ shows us how Christ was truly human. This ties into what we read in the second reading regarding Jesus learning obedience and being made perfect. 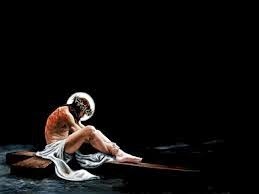 He suffered even before being scourged at the pillar. Christ asks the Father to save Him from this hour. However, he did not quit and accepted what was coming. In the Mass, we join Jesus in this hour by reliving His passion, death and resurrection. Christ is not sacrificed again, He died once and for all peoples (Hebrews 9:28, Romans 6:10, 1 Peter 3:18). This death weakened the hold of the ruler of this world who is the liar Satan (Revelation 12:11). It is no wonder why today we see all kinds of evils and crazy ideas taking over society (Isaiah 5:20). Satan knows his time is up so he has to pull all stops to try to deceive many (1 Peter 5:8). However, Christ, as He is lifted up from the earth, will draw all people to Himself (John 3:14-15). In the end, Christ wins. May Jesus Christ be praised! If you enjoy this blog, the radio podcasts, Google hangouts broadcasts or have received a free sacramental via mail, then please consider helping this work expand by donating and helping reach the fundraising goal.